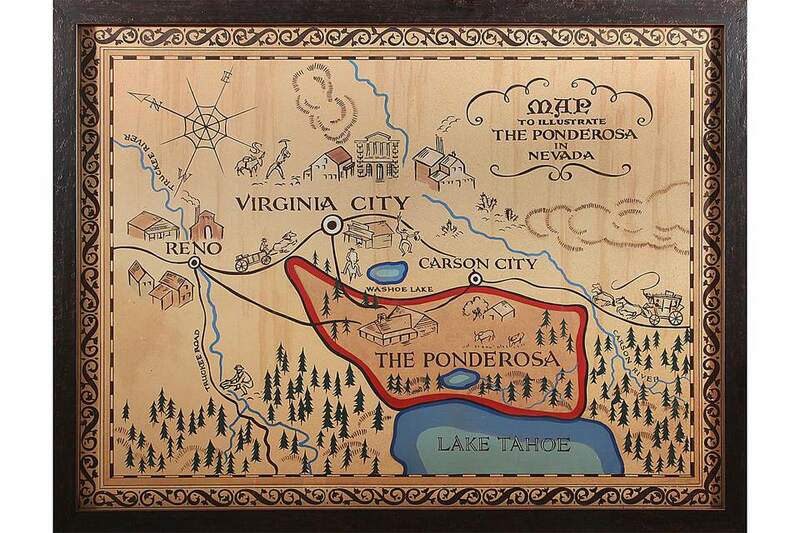 The 1960s television show Bonanza featured an idyllic opening scene with this map showing Ponderosa Ranch stretching from Lake Tahoe to Carson City. It burst into flames as the opening credits began. The fact that it was one of the first television series filmed in color and the beautiful ranch house and its surroundings were only a few of the reasons that the NBC network show became the second-longest-running western series in U.S. network television history. If you were a fan, you may have worried when Hoss was in trouble, swooned over Little Joe’s good looks, or admired Ben Cartwright’s ability to handle any crisis. 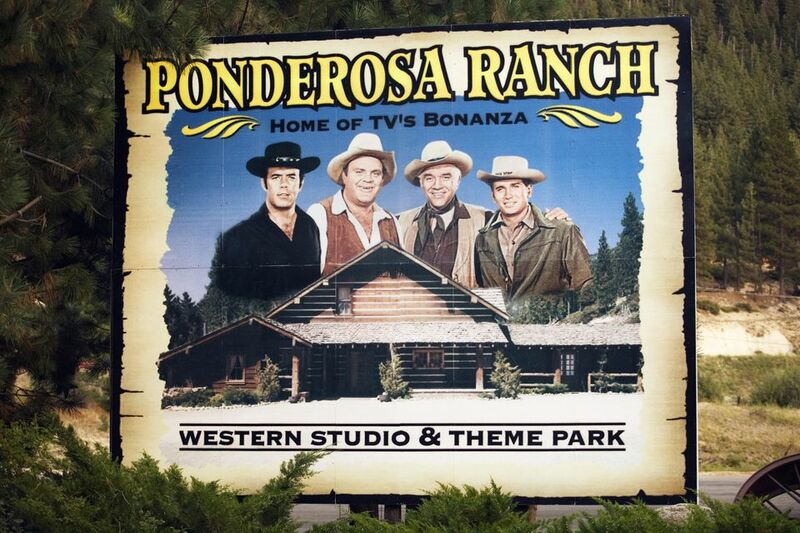 Ponderosa Ranch was the fictional home of the Cartwright family from 1959 to 1973. It’s no wonder people wanted to visit Ponderosa Ranch for themselves. You may want to do that yourself, but unfortunately, it’s no longer possible The program's Nevada set was duplicated near Lake Tahoe in 1967. On September 27, 2004, Sacramento, California's Channel 10 News reported that the Ponderosa Ranch gate closed permanently after real estate developer David Duffield bought the land. For fans of the television program who wish they could have seen it, the following describes what visitors could see when the ranch was open to the public. These photos of the Ponderosa Ranch were made in 2001. For fourteen seasons in the 1950s and 60s, fans watched the adventures of Pa, Adam, Hoss and Little Joe on the program Bonanza. For three consecutive seasons from 1965 through 1967, it was America's highest-rated show. The fictitious Cartwright family lived on the Ponderosa Ranch near Lake Tahoe, and parts of Bonanza were filmed on its shores. The famous opening scene of Bonanza was filmed on location at North Lake Tahoe near Incline Village. Lake Tahoe was among the outdoor locations used to film the weekly episodes. The house, both interior and exterior, was located on a Hollywood sound stage. Lake Tahoe contractor Bill Anderson worked with the film crews on location, cutting roads and building fake outbuildings. In 1967, he approached the show's producers and NBC with a proposal to build a replica of the house exterior in Hollywood. He would make a copy of the soundstage interior inside, creating a detailed copy of the fictional ranch house. Anderson's Ponderosa Ranch opened in 1967. The recreated Ponderosa became the centerpiece of a western-themed tourist attraction, creating a bonanza of a different type for its owner. Attractions at Ponderosa Ranch included souvenir shops and vintage car exhibits and a Wild West show, but the Holy Grail for Bonanza fans was the recreated ranch house. Outside, many visitors found the house smaller than they remembered from watching Bonanza on a small television. Inside were all the familiar Bonanza settings: the stone fireplace, Pa's desk, the dining table and the stairs. However, a short video revealed that those stairs didn't go anywhere (the upstairs rooms for Bonanza were on a separate soundstage). Visitors could see hidden panels for lighting and found that one side wall slid away for long shots inside the living room. Perhaps the most unusual thing visitors learned (and the most disturbing to idyllic childhood memories) was that Bonanza was created to sell a commercial product. Hours spent watching Bonanza, dreaming of the Wild West and swooning over Little Joe came about because RCA, NBC's parent company, wanted to sell more color televisions! After learning more about Bonanza on the Ponderosa house tour, a walk up to the photo platform gave an excellent view of the house and town. Other attractions in the town included a small chapel where weddings were held and an optical illusion called Hoss' Mystery Mine where water appeared to run uphill. You can find the show's history at IMDB and Wikipedia. ©2001 Betsy Malloy Photography. Used by Permission. These photos take you through a bit of nostalgia if you love that old television show Bonanza. For a time, the small theme park near Lake Tahoe recreated much of the old show's sets and ambiance, but now it's closed. That doesn't keep these photos from being pretty popular. C'mon, let's go see the places where you've seen Hoss and Little Joe and Pa, Adam and Hop Sing. The ranch house at the theme park wasn't only an exterior. It was a completed house inside, too. At least on the first floor. The upstairs was just a facade. Fans of the show will remember upstairs bedrooms, but those scenes were actually filmed at Burbank Studios in Los Angeles. According to the television show's storyline, the sprawling ranch house was designed by the family's oldest son, Adam Cartwright played by actor Pernell Roberts. Actor Lorne Greene (who played Ben Cartwright), reportedly built his home as a replica of the original. It sits between the first and ninth fairways of the Arizona Golf Resort in Mesa, Arizona. It is open to groups through the Arizona Golf Resort. See a photo at the Ponderosa II website. Two sequels revisited the popular television show, made in 1988 and 1993. By then, Pernell Roberts was the only surviving member of the original cast. Lorne Green died shortly before production began. These tombstones were put up for one of the sequels, memorializing Hoss as "Gentle giant" and Little Joe: "Larger than life." Michael Landon, Jr. and Dirk Blocker, sons of the original series' stars appeared in the 1993 Bonanza: The Return. This view of Lake Tahoe was a common sight in the show, making it appear as if much of it was filmed on the Lake Tahoe site. In fact, most of the filming happened in southern California at the Burbank Studios and later at Warner Bros. However, the later sequels did much of their filming at the theme park. Taken from the trail above the house, this is a view of the replica of Virginia City built at the ranch. Most of the television show town scenes were filmed on the back lot at Paramount Studios in Los Angeles. The town here was created for the theme park and very few of the original Bonanza episodes were shot there. You can tour Paramount Studios when you're in LA although you may not recognize any of show's set in today's lot. Activities there included a visit to Hoss' Mystery Mine, panning for gold, and a Wild West show. And the most popular thing to eat was the "Hoss Burger." On the television show, it took about two hours to get to the real Virginia City which is approximately 60 miles from the ranch site and a fun place to visit if you love gold rush towns and old-timey ambiance.